This new 25+1 high capacity shotgun from Kel-Tec the KSG 25 is a game changer. With that many rounds of 2 3/4 shotgun shells you can load it once and go all day. 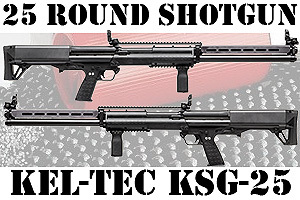 Kel-Tec continues its specialized focus on skilled professionals and enthusiasts with its KSG-25. While the company admittedly does not have a lot of shotguns, what shotguns it does offer are noteworthy. The addition of the new KS-25 to its shotgun inventory is an exciting one, especially for fans of tactical shotguns as well. Read the rest of New 25+1 Capacity Shotgun! 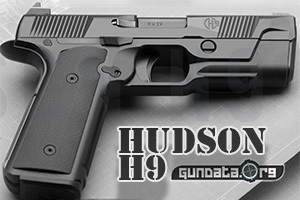 The Hudson H9 is a pistol so revolutionary it has 7 patents, this gun is a game changer in so many ways. The Hudson H9 is an American-made pistol with an attractive look and design. Hudson made this gun with technological advancement in mind, which is why the company currently has 7 patents pending on this pistol. What Hudson focuses on with the H9 is precision. This is why youll fight a straight-pull trigger design based on the 1911. Hudson also maintains that precision focus with a lower bore axis and impressive sights. Everything about this gun is designed to keep repeated shots on target, making the Hudson H9 perhaps one of the most definitive precision pistols in a long time. Dont be surprised to see this one popping up at shooting competitions in short order. When it comes to the survival of our species there is nothing more important than having a good gun on your side. 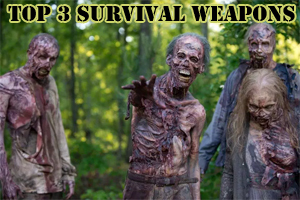 Here FPS Russia details his top 3 choices for survival guns. FPS Russia is an internet personality, YouTube star. If you are browsing this website we are pretty sure you know who this guy is. Check out the video and if you like be sure to subscribe to his channel. Technology has brought about the merging of a daily tool that one cannot live without, and a weapon that is used for personal protection. Minnesota based Ideal Conceal, through the creative genius of Kirk Kjellberg, have developed a pistol that is able to fold and resemble a smartphone. This is in response to the growing need that people have for carrying concealed weapons to keep themselves safe. While there have been developments in jackets and bags to help carry concealed weapons, nothing comes close to this latest offering. 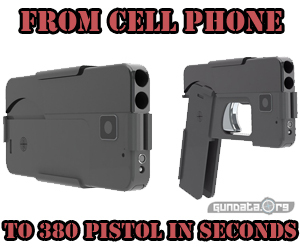 By folding into itself and taking the form of a smartphone, it is possible to carry this weapon around without it being detected since it takes on an unexpected form. 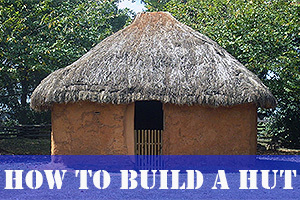 It is approximately the same size as the Samsung Galaxy S7. So which is the better cartridge the 45 ACP with its hard hitting slow moving projectile or the low recoil high capacity 9mm? Let's take a look at all the data and see. We also know this is a touchy subject, people do love their cartridges. 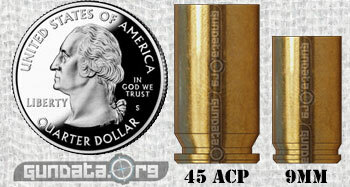 We are going to do what we always do here at GunData and look at all the information and compare the 2 cartridges in a very accurate and easy to understand manner. Like they always say...if you can't explain something simple you don't truly understand it.